How long is your dental wish list? If you're like most patients, you've considered several cosmetic dental procedures to help whiten, straighten or reshape your teeth -- but for a total smile makeover, natural-looking dental veneers may be the fastest way to create a beautiful new smile. Veneers are thin, porcelain shells that are attached to your existing teeth to meet a variety of cosmetic goals. Your dentist can match them to your natural or desired tooth color for a uniform, authentic appearance. 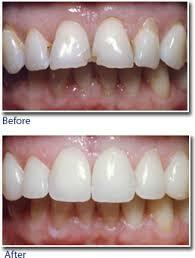 Porcelain veneers are also highly stain-resistant and may actually strengthen your natural teeth. Rather than spending years with braces and multiple appointments for dental bonding and other cosmetic procedures, your dentist can completely transform your smile with teeth veneers in only two dental visits. For those of us with dental work who like to talk, laugh or smile, a silver filling shows the world we could have taken better care of our teeth. But what if there was a way to hide the fact that you even had any cavities in the first place? Composite resin is a filling material designed for aesthetic dental restorations. Formulated to resemble the color of your natural tooth, composite resin is often used for filling cavities or for bonding front teeth. Composite resin consists of glass or quartz filler added to a resin medium, which produces a tooth-colored filling. The invention of composite resin offers a substitute to the amalgam (silver) dental fillings we've grown so accustomed to. This plastic and glass mixture contains no metal and can be shaped to resemble a real tooth. Onlookers usually can't tell that a tooth has even been filled! 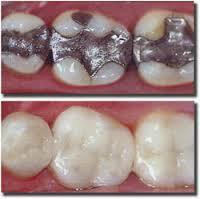 For years, amalgam was the only option for filling teeth. Those who wanted natural-looking restorations had to opt for more expensive cosmetic treatments, such as a crown or onlay. Composite resin enables dentists to cosmetically treat dental cavities without using invasive procedures.